You are driving on the road, and from nowhere, the Service Engine Soon light appears on your dashboard. What to do now?, Will my engine get damaged if I continue driving? Should I stop the car right now and tow it to the mechanic workshop? How expensive will this be to get it repaired? There are a lot of potential questions that may pop up inside your head. But do not worry, the service engine soon light is not as dangerous as it seems. I give you all the information that you need, and the meaning of the service engine soon light. The service engine soon light means that there is a minor problem with the electronics or the engine of your car. Some manufacturers are using it as a Check engine light for minor issues. It could also mean that it is time for a scheduled service, like time for oil or spark plug replacement. Some manufacturers do have only one indicator for both the scheduled service and engine problems. What to do when the Service Engine Soon light appear? When you are on the road and your service engine soon light appears, you will probably not have any diagnostic tools with you. But what you could do is to check the most common causes of a service engine soon light. There are some straightforward checks that you can do on the side of the road yourself and in many cases solve the problem. The service engine light could also occur in different colors and you should be aware of the colors. Yellow light = Minor Issue/Drive to the workshop or diagnose it yourself as fast as possible. Red Light = Major Issue/Stop and turn off the engine as fast as possible and get it towed to the closest mechanic shop for an inspection. Check in your repair manual if you have it with you, what the service engine light means on your car model. Check all fluid levels including the Engine Oil level, Brake fluid level, Wiper washer fluid, automatic transmission fluid (If you have a dipstick for it) and the coolant level. Listen if you could hear any bad noises from the engine. Check your service manual when your last scheduled service was done and check if it’s time for a service. Call your authorized dealer if you have a digital service manual or try to find any information on your dashboard menu. If you can’t find any problems, you have to take your car to a workshop to read the trouble code memory from your vehicle. You can also do this yourself if you have an OBD2 scanner at home. If you do not have one and would want one you can check out our OBD2 scanner review article. Check your engine control unit for any stored trouble codes. If you got any codes to save the codes and try to get information what it/they mean. If there are emission trouble codes that are not that dangerous for your engine, you can try to erase the code to see if the engine service soon light is coming off. If the light gets off when you are deleting the codes, it means that any of the stored codes are causing the service engine soon light. The most modern OBD2 code readers have an inbuild trouble code library where you will find solutions and causes for the problem. If you do not have it, you can check our OBD2 code list or ask us a question on our homepage, and we will help you out. Some manufacturers (The most) are using one “Check engine” light and separate scheduled service light. 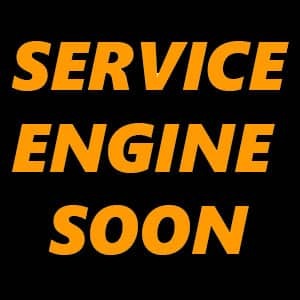 The check engine light is coming up when the engine control unit or the transmission control unit has detected a fault in the engine or transmission system. If your Check engine light is ON, the easiest way to diagnose this problem is to always check your trouble code memory with an OBD2 scanner. 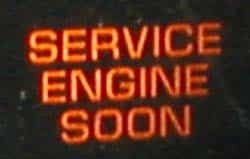 The check engine light will not light up if there is a scheduled service as the service engine soon light. It does only occur when there is a problem with your engine. I did reset the service engine soon light, but it came back, How come? The engine control module is doing tests of all the engine components at every start-up and warm-up. If it has failed a test several times, it will notice that something is not as it should be. That is why it can take a long time before the engine control module is detecting these problems. Electrical problems are often detected imminently and do not require start-up tests to notice it. If the service engine light appears again, you have to reread the trouble code memory and try to get more information and solution to the problem. If you want help to solve your troubleshooting problem you can get free help for us at our homepage. Do not panic if the service engine light appears, it is most likely a minor issue. You can read the trouble code memory yourself at home if you are using an OBD2 scanner. If it is a red light, stop your vehicle and engine as fast as possible. If it is a yellow light, you can go through our checklist. I hope you have learned something from this article. If you have any further questions, you can leave a comment down below or ask us a question on our homepage.